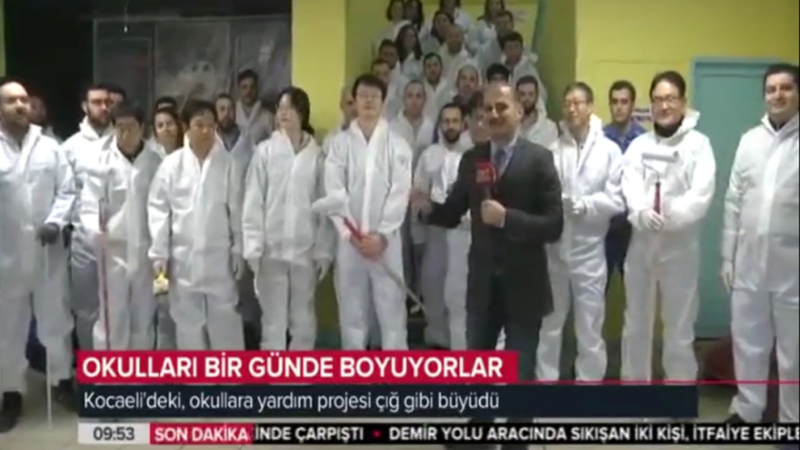 On January 12, Turkey’s national broadcaster TRT, Turkish Radio & Television, live-televised the regular volunteer activities of POSCO ASSAN TST. ▲POSCO ASSAN TST’s on-going volunteer activities televised live across the country on Turkish national TV. A local reporter is interviewing the employees volunteering at a local elementary school. POSCO ASSAN TST is a cold-rolled stainless steel production subsidiary in Turkey with an annual production capacity of 200,000 tons, located in the city of Izmit 100km to the southeast of Istanbul. To contribute to the local communities in Turkey and build long-term mutual trust, POSCO is implementing the company’s ‘With POSCO vision’ through various measures: fostering local talents, creating jobs, supporting underprivileged communities, facilitating cultural exchange between Korea and Turkey as well as supporting Korean War veterans in Turkey. Since 2016 in particular, POSCO designated the second Saturday of every month as the ‘POSCO ASSAN TST Volunteer Day,’ and employees have been volunteering for low-income families, orphans, and senior citizens living alone. Rather than sporadic financial support, POSCO employees are contributing their time and resources repairing the facilities of different communities. Broadcasted on that day was POSCO ASSAN TST’s very first volunteer activity of the year –over 40 employees including the company CEO Don-Ho Ban spent the day repairing old classrooms of a local elementary school. A regular volunteering activity is a rather unusual sight in Turkey, especially from a foreign-invested enterprise, which is why POSCO ASSAN TST’s on-going volunteering piqued TRT’s interest. The TRT news crew was at the site of POSCO’s volunteering and live-broadcasted the event during the main news hour.